In Greek and Roman mythology, carefully described by Ovid, there is this a tale about the four ages, which are rendered by the name of metals: the ‘golden age’, the ‘silver age’, the ‘bronze age’, and the ‘iron age’. 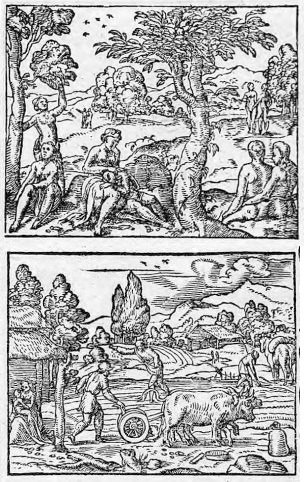 Of the four ages, the golden age represents the perfect state, where gods dwell among humans, all humans are equal and respect each other, food and clothes are found in abundance, and war is absent. Thereupon, each of the continuing ages represent a decay in the conditions and in the morality of humans, and during the final state, the iron age, humans are at constant war, friends and brothers kill each other, families are separated, and hunger dominates. In the end, evil rules the entire earth. This myth is paralleled in the Old Indic myth about the yuga, the world ages, which are also described in terms of metals. Even today, for instance in a competition or a race, or in the counting of wedding anniversaries, we value the metals in the order gold, silver, bronze, iron. Even though, for instance, bronze has been out of industrial use for a long time. So, the question remains: does this reflect a historical development of metallurgy or is it simply a mirror of humans’ value of the various metals? And how is this ancient evaluation of the metals reflected in language? Like many other things, metallurgy emerged in the area of West Asia and Anatolia 10-8,000 years ago, together with the development of agriculture. In the earliest phase, metals were used to decorate pottery, and only later, a proper industrial use of metals emerged. The earliest metal objects, which were made of copper, were various tools; in particular small knifes or daggers. Around 6-5,000 years ago, the technique of smelting copper through furnaces was found in Mesopotamia, Egypt, Anatolia, Central Europe, Caucasus, and the Steppe area, and from Balkans the new technique spread quickly over all of Europe. This marks the beginning of a new era, labelled Chalcolithic, which also implied the emergence of many other important techniques, such as the wheel, the plow, and the domestication of the horse. An important result of the metallurgy, not just in mythology, was the emergence of large-scale war parties – more like ‘wars’ in a modern sense, with organized armies and massive killings in battle grounds. Around 4,000 before present in Anatolia, the processing of a new metal would imply a historical change in the entire area and pave the way for the industrial revolution millennia later: iron. Since this metal requires higher temperatures for smelting, a technological improvement of the furnaces and technology was necessary to enable the smelting and preparation of objects of iron. This marked the beginning of a new era, the Iron Age, where tools, ploughs and weapons were hardier, sharper, and more efficient. Again, the iron affected both agriculture and warfare, something that we should suppose lies behind the mythical interpretation of the Iron Age. Gold and silver, which are soft and shiny metals, are worthless for industrial use. Nevertheless, they are more appreciated than copper and iron. Why? The answer is complex. Iron and copper are associated with warfare and technology, gold and silver with shiny objects and wealth. Already in the Neolithic, and increasingly so during the Chalcolithic, gold was used for ornaments on weapons and objects, typically hammered out into thin, thin layers – something that indicates a high value and exclusiveness of this metal already at an early stage. First during the early antiquity, gold and silver became what they still are (at least to the abandon of the gold standard after WWI): a standard for measuring the value of all other objects. What does language tell us about the history of metals? Actually, relatively much. All the basic metals can more or less be reconstructed to the Indo-European proto-language, just as to Caucasian families, and the reconstructed forms, as well as the meaning changes of the metal words, give us important information about their emergence and early use. Gold in Proto-Indo-European is derived from a root with the meaning ‘yellow, green’ as well as ‘shining’ (PIE *ǵhelh₃-to- ‘gold’ < PIE *ǵhlh₃- ‘green, yellow’). In languages, gold words typically change to meanings ‘shining’, but also to ‘coin’, ‘wealth’, and ‘currency’. Silver has a different story. The main word for silver in most languages, including non-Indo-European, is a migratory root with an obscure origin, *silubhr-, which spread secondary at a very early state (probably at proto-language level) and became the standard word in most Eurasian languages. Again, some languages formed roots from words meaning ‘white, shining’ (PIE *h₂erǵ- ‘brilliant, white’, which among other underlies the Tocharian A-speakers word for themselves, ārśi). This indicates that gold was an indigenous metal in Indo-European and Caucasian, whereas silver spread secondary through the early stages of proto-languages. Copper, bronze and iron have different stories. A term for copper can be reconstructed to Proto-Indo-European (PIE *h₂éi-es- ‘metal, copper, bronze’) as well as to Caucasian proto-languages, indicating that these people were familiar with copper and likely produced copper industrially. Words for copper and bronze are completely intertwined in various languages, indicating that people of the past did not distinguish these metals by their names. Iron cannot be reconstructed to any proto-language. In languages, iron-words are derived either from a root ‘red, bloody’ (Proto-Indo-European *h₁ēsh₂r-no- ‘bloody, red’, underlying, e.g., English iron, Swedish järn), or they are initially designations for other metals, which have received the meaning ‘iron’ (Proto-Uralic *waśke ‘copper, metal’). The Proto-Finnic word for iron is a loan from Proto-Germanic, *rauðan- ‘bog iron’, which originally meant ‘red’. The value and cultural function of the various metals emerges out of the patterns of how words for metals change their meaning. Gold and silver words change their meaning to (or colexify with) ‘wealth’, ‘currency’, ‘coin’, ‘shining’, ‘bright’, gold with the colours ‘yellow’, ‘blonde’, and silver with ‘white’. Words for copper change their meaning to (or colexify with) with ‘tin’, ‘zink’, ‘lead’ or other metals, iron with ‘sword’, ‘weapon’, ‘tool’, ‘toughness’, but also ‘red’ and ‘blood’. 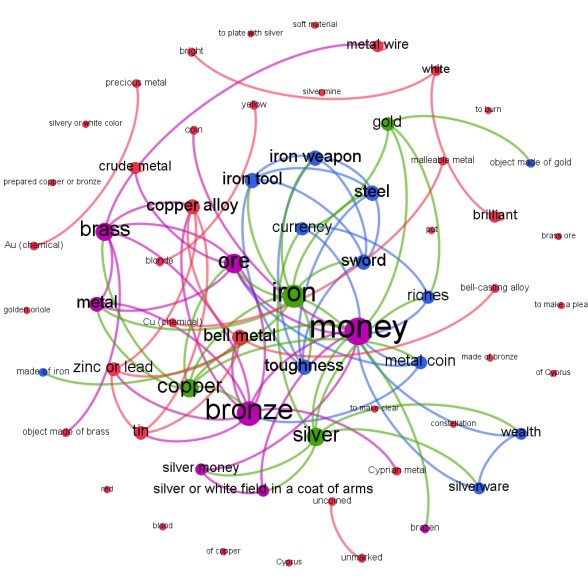 Semantic network of colexifications (blue) and coetymologizations (red) or both (purple) of Indo-European metallurgy words (green). Graph by Niklas Johansson. That can't actually be reconstructed to PU, because the sound correspondences aren't regular; most likely it's an early Wanderwort in the family. I've heard the <i>silver</i> word comes from Akkadian and can be derived from "(s)melt" there?